Drone Strike takes you on a fast-paced adventure across the Mediterranean, into Mexico, finally arriving in the States. Karim’s family is killed by a U.S. drone strike in Iraq, collateral damage. The Islamic State in the Levant exploits his rage, recruiting him for a terrorist attack on the U.S., and only Anthony Provati can stop him. Drone Strike takes you on a fast-paced adventure across the Mediterranean, into Mexico, finally arriving in the States. 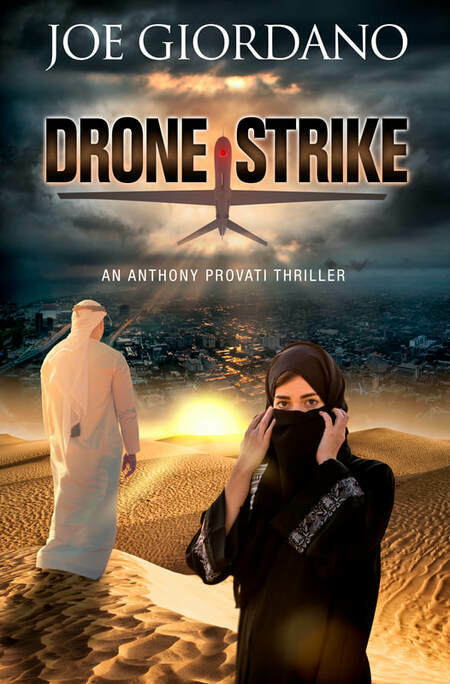 Drone Strike explores the psychological realities that seduce Karim to commit an act of terror, includes a love story between Moslem Karim and Miriam, a Christian woman he defends in Turkey and highlights the plight of Middle Eastern and Central American refugees. Drone Strike is intense, full of emotion, raw, painful and touches on the human perspective of conflict. Karim loves his family and will do anything to keep them safe in Iraq even though his wife has pressured him to move them, he feels they will be safe. This all changes one day when his family is killed by a US drone strike as collateral damage. He is left full of anger, hate and bitterness. He will do anything to avenge his family and these emotions make him prey to others with dangerous plots. This takes Karim down a very dangerous path of death, murder and suffering. We witness Karim be conflicted at times on what he is doing especially after he meets Miriam, a young Christian woman whose family was murdered by the men he is helping. They develop a relationship that you never see coming but one that is built on shared pain and understanding. Despite being from different backgrounds, their shared loss brings them together. This is an intense but thrilling novel from start to finish. It builds up dramatically and leaves you not wanting to put the book down. There are so many tiny pieces woven into this story and this adds to how the plot unravels. I loved every moment of this novel and could not put it down. You can purchase a copy of this book on Amazon, Barnes & Noble and Kobo. experience included running a business in the Middle East out of Athens, Greece. Born in New York, he’s had first-hand experience with the cultures and most of the locations in Drone Strike. This entry was posted in book review, iRead Book Tours, iRead tour, Uncategorized.